—François Bourguignon, Emeritus Professor at Paris School of Economics, Former Chief Economist of the World Bank. —François Maniquet, Professor, Catholic University of Louvain, Belgium. Development Program and the Organization for Economic Co-operation and Development) that help to judge the performance of a country in the various dimensions of well-being. 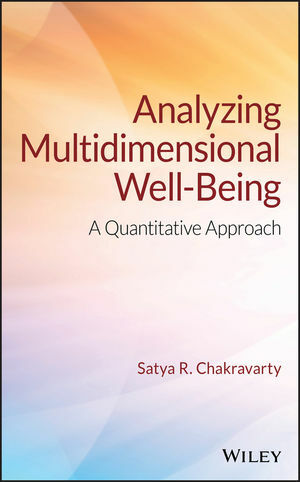 Written for students, teachers, researchers, and scholars, Analyzing Multidimensional Well-Being: A Quantitative Approach puts the focus on various approaches to the measurementof the many aspects of well-being and quality of life. Satya R. Chakravarty is a Professor of Economics at the Indian Statistical Institute, Kolkata, India. He is an Editor of Social Choice and Welfare and a member of the Editorial Board of Journal of Economic Inequality.